VIEW THE VIDEO BY CLICKING HERE or let the Tourism News know if/when it gets taken down by telling us here. VIDEO footage of handlers at Adelaide Airport recklessly throwing packages around has gone viral with almost half a million views. The 17 second video — shot by a member of the public from a car— has been shared over 30,000 times in the last hour. It was first posted on the Facebook page of “Pinky BuaChompoo”. The Advertiser has confirmed the name is an alias of a prominent South Australian kickboxer. He has asked that his real name not be published. “I was just sitting in my mate’s car when I saw them doing it,” he said. “The reason why it bothers me is that I send stuff all the time internationally and domestically and the stuff ends up in damaged boxes. A spokeswoman for International freight courier company, DHL Express, has confirmed the authenticity of the video. She said DHL was “shocked” at “all levels of its operations” by the contents of the video. “DHL is obviously shocked to see the handling of the shipments in such a way,” she said. 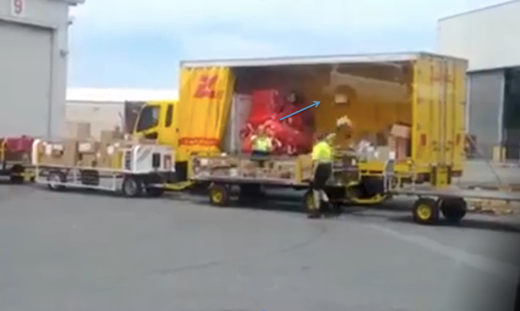 The spokeswoman confirmed only the person supervising the baggage — seen standing at the front of the trailer — is a DHL employee. “He has been spoken to today as part of the investigation but has not been stood down,” she said. “The other two people are not DHL employees and are employed by a supplier. The spokeswoman said the company was unaware when the incident occurred and what the packages contained. “DHL is proud of our customer service record and this incident is a rare event”,” she added.